Study reveals the inconvenient truth about Greenland’s ice sheet — It’s thickening! Greenland’s ice sheet is thickening, according to a new study, which also notes ice is moving more slowly towards the ice sheet’s edge than it has, on average, over the last 9,000 years. “Like many others, I had in mind the ongoing dramatic retreat and speedup along the edges of the ice sheet, so I’d assumed that the interior was faster now too. But it wasn’t,” Joe MacGregor, the study’s lead author and a geophysicist at The University of Texas in Austin’s Institute for Geophysics, said in a statement. MacGregor and his fellow authors created a database mapping the layers of Greenland’s ice sheet and flow patterns over the last 9,000 years. Using this “paleo-velocity” scientists found ice from Greenland’s interior is flowing to the edges more slowly than it did during most of time in the past nine millennia. So, what’s slowing the ice down? Researchers said Greenland was hit with much softer snow during the last ice age, which has stiffened over time and caused the ice to flow more slowly towards its edges — all of this has caused the ice sheet to thicken over thousands of years. Southern Greenland has seen lots of thickening because of increased snowfall, according to researchers, but that’s not the cause of thickening for other parts of the ice sheet where snowfall isn’t increasing. “But that didn’t explain what was happening elsewhere in Greenland, particularly the northwest, where there isn’t as much snowfall, so the stiffening effect isn’t as important,” said MacGregor, adding that the northwest is getting thicker because of the collapse of an ice bridge 10,000 years ago. Despite their findings of Greenland’s slower ice flow, the researchers claim this doesn’t “change the fact that the ice sheet is losing mass overall and contributing to sea level rise,” according to the study’s press release. 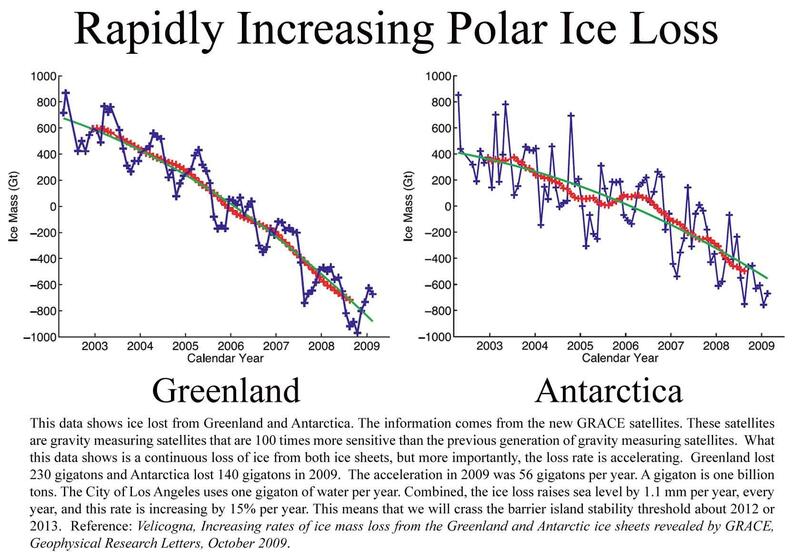 But the IPCC also claims Antarctica’s ice sheet — the largest in the world — is losing mass. The international body said “there is high confidence that the Antarctic ice sheet is currently losing mass” in its 2013 climate report. New research, however, directly contradicted the IPCC’s claims. A NASA study from last year found Antarctica’s ice sheet had increased in size from 1992 to 2008. In fact, scientists said the South Pole has been thickening from increased snowfall over the last thousand years. “We’re essentially in agreement with other studies that show an increase in ice discharge in the Antarctic Peninsula and the Thwaites and Pine Island region of West Antarctica,” Jay Zwally, a NASA glaciologist and lead author of the study, said in a statement. “Our main disagreement is for East Antarctica and the interior of West Antarctica — there, we see an ice gain that exceeds the losses in the other areas,” Zwally said. To keep the propaganda march going, they do love to cherry pick short term trends, ignoring obvious mitigating factors. For instance, 2014 was a polar vortex, and while it brought Arctic air to freeze North America, it sent warm air into the North Atlantic. 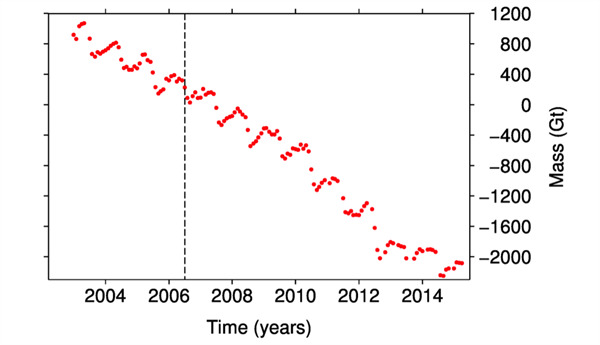 Thus, Greenland set new ice melt records. The thing is, that record was from the last Polar Vortex in 1929…Then, happy day! 2015 was a strong El Nino, bringing heat up from the Pacific Ocean depths to warm the entire planet, and if you chart just 2010-2015, it looks like a trend! the El Nino have ever had any impact on the long term trend. Your comment would be totes devastating if it had command of the facts. But it doesn’t. 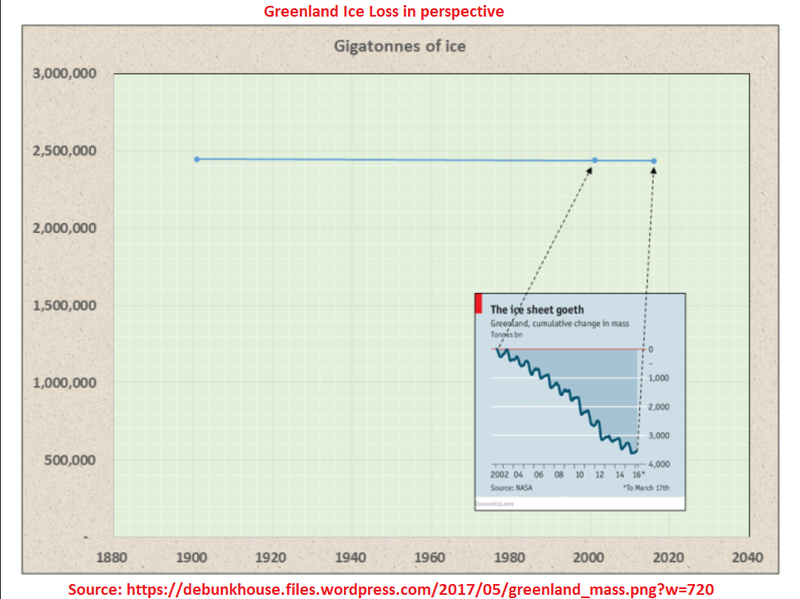 Greenland ice is losing mass. Did I say it wasn’t losing mass? As always, Dano2 is an idiot, who makes idiotic one liner comments, because that is what he does. My point, is as always, the Catastrophic Climate Change Cult’s propaganda uses just enough “facts”, presented in a misleading way, to misrepresent the truth. That is what propaganda does. A funny thing happens when you take the sea level rise that the melting of the entire Greenland Ice Sheet, and divide it by the shortest time they are willing to predict it would take for it to melt. You get the exact same, minute, annual contribution to sea level rise we are seeing now. Out of 3 mm/year, which works out to about a foot per century, the contribution of the Greenland Ice Melt is about 0.7 mm/year. Thanks, smartie boots, you agree then that this Bastasch piece is disinformation. Even IF we would take your .33 mm/yr number, according to NASA, sea levels are only rising a foot PER CENTURY. Please explain how this supports your global warming fear mongering. Also, how could your so-called “scientists” be so horribly wrong? You know, The ones who predicted 100 foot rise in sea levels over 100 years. Why should anyone trust you or them? You are either a hapless dupe or a lousy liar if you are using that link to support your ludicrous assertion. Or a buffoon character in an Internet Performance Art skit – in which case, I LOLzed at this character, my kudos to the author! Purposely dishonest from Bastasch. Citing LoWatts is all you need to know. But it is good to know that Bastasch is not telling DC readers the whole story and is purposely misleading you. How do we know Bastasch is purposely misleading you? Bastasch busted in big fib. Perhaps you will respond to my previous question and explain exactly how co2 reacts to be responsible for man made warming? What you are unable to explain you do not understand. The IPCC and their cronies continue to spread stories devoid of the truth, because they know they have a liberal following (including politicians with an agenda) who will believe everything they say, and will give them money to continute to say it. These paid liars need to be shut down so people can know the truth. You were duped. You should not choose to believe this story. Um, cuz ice sheet not thickening? Is this a trick quershin? repetition is not an explanation. I thought you were supposed to have at least a basic knowledge. The ice sheet is not thickening. If you can’t grasp this very basic fact, I can’t help you. No one can. “Tom Steyer spent nearly $75 million in the 2014 midterms, reports Politico. He intends to “open his wallet even wider” now. ” Dano2 is doing a pi$$ poor job considering the financial incentive he has and the vast amount of propaganda resources he has at his finger tips. But that is the tea baggers propaganda machine for you. This study does not look at this from an aspect of climate change! Of course the ice sheets are thickening now compared to 1,000 years ago. An inconvenient fact for the climate alarmists is much of the world was warmer from approximately 1300 to 1000 years ago. How do we know that? Because the Vikings were farming land in Greenland then that is now unfarmable permafrost! Ice sheets are not thickening, you were duped. Nor was it warmer 1000k years ago. Ouch. Greenland most certainly was warmer. Go back to science class and figure out how farmland that was being farmed 1300 to 1000 years ago is now permafrost. Get your head out of the permafrost and see the whole picture, not just the politically correct “green (in name only) picture that has been painted by those who have been seduced by the anti-fossil fuel theology. Don’t get me wrong, I certainly believe there is much we can and should do to clean up our act. But I firmly believe investing in very expensive, very environmentally unfriendly alternative energy technologies will NOT get us there and in many cases causes more harm than “dirty” technologies that are being replaced. Much of the hype about green energy is false propaganda! You stated much of the world was warmer. It was not. Again you fail to do your research. The Medieval Warm period was from approximately 800 – 1300 AD. Quit believing the false propaganda and do your research. I’m tired of dealing with ideologues who pick through data to make a point when readily available data negates their point. Dano2, much of the world was WARMER 1000 years ago! Thanks for knowing some dates. It is warmer now. Standard rube link. You were duped into believing that link supports your wish. Michael Castillo – just ignore Dano2. He is a complete idiot who goes on these comment pages for all news stories related to climate change and froths at the mouth with lies and obfuscation. Even if you quote or provide links to honest, accurate scientific proof that he is wrong, he will simply say “it’s not true”. He is a typical Obama-loving, socialist boot-licking liberal piece of crap. IGNORE HIM !! !